Did you have the luxury of consciously choosing your company's corporate culture from the start? Or, are you like most small and mid-sized business leaders who did not consciously decide what kind of a corporate culture should be developed and maintained in your company. If so, then the culture that you have, just developed on its own. It's a given that in any work environment a corporate culture will develop. The coming together of people in a workplace guarantees the development of a workplace culture. The question is whether the corporate culture that develops serves the best interests of your customers, the satisfaction of your employees, and your organization's future progress and continued success. Sometimes, you luck out and it does. And, sometimes you need to consciously decide how to make your culture better support the attainment of your business goals. Consciously determining the corporate culture that will best serve your interests and goals is a priority in organizations. So is communicating that culture daily by your actions and the behaviors that you reward and recognize. Assessing that culture periodically, to see how you're doing, is the third critical component in consciously shaping your corporate culture. 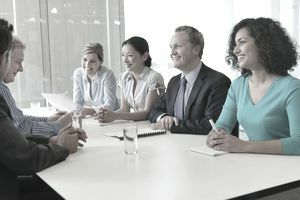 The first step in understanding what your current corporate culture looks and feels like to employees and your other stakeholders is to assess the state of your current culture. You can do this in a variety of ways that are laid out in how to understand your current culture. Additionally, keep an open ear and listen to what employees are saying, talking about in their stories, or complaining about gives you a lot of information. So will a periodic employee satisfaction survey. Checking in with new employees to learn about their experience of joining your company is useful, too. Then, depending on what you discover, you can make plans to change the culture if it's not emphasizing what's important for your business. When you think about changing your organization's culture, you don't always have to think on a massive scale or about total organizational change. A few persistent people can make powerful changes with commitment and persistence to any aspect of your corporate culture. You'll be able to relate to this example for sure. In one company, managers and other attendees had developed the habit of arriving late at meetings. This dishonored the time of the meeting participants who came on time and extended the time of every meeting, usually causing the next meeting scheduled in the conference room to start late, too. This habit of running late interfered with the start of the attendees next meetings, too. Grousing about the culture of lateness went on for years until a couple of brave managers decided to change the rules. Henceforth, they said, all meetings would start on time, end on time and anyone who was late was responsible for their own catch up outside of the meeting. And, any decision made by meeting participants, even without the input of the late arrivers, would hold. Oh, and by the way, every meeting would have an agenda, distributed 24 hours before the meeting, or these key managers would not attend. Change was painful. Meeting participants resisted change. Employees showed up late, failed to distribute agendas and no meeting ever had the people needed for a decision in attendance at the beginning. But, rather than caving to popular pressure, a committed group of employees honored the rules and moved forward. Within months, just prior to every scheduled meeting, you'd see a scurrying in the halls as people rushed to show up for their meeting on time. They also developed the habit of ending the meetings 5-10 minutes early so people with back-to-back meetings could attend their next meeting on time. Additional rules in the company about meetings changed, too. Meetings did not have to last an hour. Agendas were written to allow people who only needed to attend part of a meeting to leave when their input was complete. People were prepared - although that was the next battle - employees began canceling meetings on the spot when participants came unprepared for the discussion Because they had related material and meeting minutes in advance, they were expected to come prepared. An employee needs to decide that the organization needs a different approach. The employee should find an ally or two to support the change he or she wants to make. The employee needs to gather input and lay out the ground rules about the way coworkers want the environment to work - from a late culture to an on-time culture, in this case. Communicate the new expectation to all and stick with it through all of the testing and change resistance that is thrown in their path by less committed coworkers. Make the stated consequences occur. When the change has been thoroughly integrated, look at what else about the workplace or that particular activity in the workplace can continuously improve. In this case, they improved team meetings in other ways. This is one element of a workplace culture that costs employers billions of dollars every year in lost productivity, rework, and hard feelings. You can apply these steps to other elements of your culture, or starting with your senior team, you can consider consciously choosing the entire corporate culture for an existing organization. Since few organizations consciously shape their corporate culture from their founding, most are changing the culture that has transpired. With this in mind, see more about how to consciously change your corporate culture. You can teach employees about how to create the culture that you need to accomplish your business goals.